Customized mugs with names, text and letters are the excellent promotional idea for companies, tradeshows, reunions, business or corporate gifts with your logo. Custom mugs are also perfect way to personalize your office or desk by making your favorite message seen. We deals in Inside Colour Printing Mug. Colors: Red, Blue & Black. 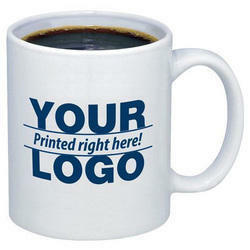 Our firm is among the trusted names, engaged in offering a wide range of Customized Mug. To preserve the quality, experts also check the quality of this product as per worldwide industry norms.